The ShabbaTones, unique among area synagogues, features a talented, acoustic electric band that enlivens services and festivals throughout the year. 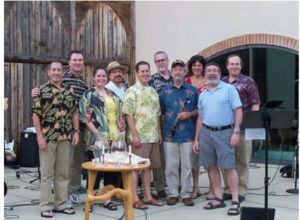 Comprised entirely of Temple members, the ShabbaTones play in a variety of styles appropriate to the occasion, from traditional to folk to rock ‘n’ roll. Regular performances occur at the Picnic Shabbat services, Simchat Torah and at the Family Purim Shpiel. New instruments are always welcome, especially strings, woodwinds, and brass. Musicians should contact Cantor Eschler.